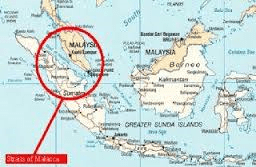 This narrow gap separating Indonesia and the tip of the Malay Peninsula was long recognised by the British as the fulcrum of trade and military power in East Asia and one of the “keys” along with Gibraltar and the Suez Canal that “locked up” the world through naval power. Singapore lies to the north of the Strait and was the centre of Britain’s Far Eastern military command, its position ensured the construction of huge sea facing fortifications (which in the event proved useless when the Japanese managed to attack by land in World War Two), to protect it and its loss was arguably Britain’s worst military defeat of the twentieth century. Singapore’s strategic position and good governance has made it one of the world’s great hubs for shipping and commerce, it is by some measures the globe’s busiest port (vying with Shanghai for this particular honour). As well as watching over the immense flow of electronic and consumer goods leaving the factories of Asia to the shopping centres and malls of Europe and the Middle East, in the other direction the Strait sees a hefty proportion of the world’s oil supplies en-route from the Gulf to China and the US. Overall a quarter of the globe’s merchandise pass through the Straits. Therefore the idea that the Strait could be closed or shipping stopped by a hostile power has long occupied the minds and plans of politicians and military chiefs among the world’s great trading powers, while the US does not have a permanent Naval presence there, it has a number of aircraft carriers in the region and retains strong relations with Singapore as well as its neighbours. Beijing also retains good relations with the city-state which has a majority ethnically Chinese population, helping to cement ties between the two. China is currently developing its naval capacity and while it remains a long way behind the US, it views protecting its overseas trade as a major priority and lack of control over the Malacca Straits is of huge concern. A String of Pearls starting at the Isthmus of Kra ? The next few years will see Beijing become more assertive in its “backyard” particularly on issues such as control over islands in the South China Sea and Taiwan. There has been speculation that this will manifest itself in a “string of pearls” – a series of naval bases in Asia and the Indian Ocean to buttress Chinese power, but so far there is no sign of this materialising. In the longer term China will want the US to accept it as more of an equal, something Washington may find very hard to accept, how this particular dynamic unfolds over the coming years is crucial for peace in the region. Interestingly there were once rumours the Thai government would cut a canal through the Isthmus of Kra, (the narrow central section of Thailand) financed by the Chinese, reducing shipping times and the strategic importance of the Straits of Malacca at a stroke. This kind of bold move could strengthen China’s hand, but at the risk of angering the Americans than their allies.